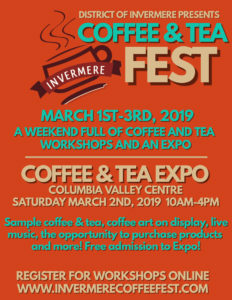 This exciting event includes a full facility tour of Kicking Horse Coffee, see their roasting and packaging facility, learn about sustainable coffee production from a fair trade and organic approach. Explore coffee varieties, roasting methods, decaffeination methods, and cupping. It is sure to be a wonderful and enlightening seminar. Safety is important to us, here are a few must-follow rules: No jewelry, no open-toed shoes, no bags, purses or backpacks, no fragrance and sorry, no photography. Tours not recommended for children younger than 10. All tour participants must be pre-registered. Limited space, sign up early!